When I was a kid, all I ever knew about Pears, and most fruit for that matter, was the kind that you opened up with a can opener. 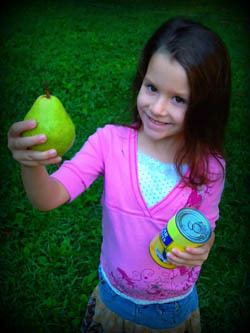 When we opened a can of pears as a side dish for our dinner time meal, we thought we were doing a good thing. Isn’t it better to open a can of fruit than a bag of sugary treats? Little did I know, those poor little soggy pieces of pears were soaking in sugar and high fructose corn syrup. The food we assumed was better for our health was just as bad to eat as the junk food we were avoiding. The side dish to our meal may have well been a serving of candy! 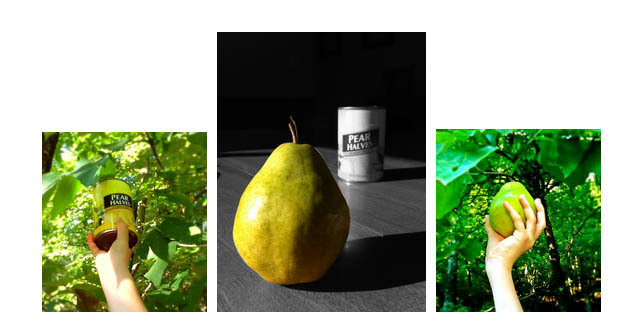 Last year, however, I experienced, for the first time, the brilliance of a freshly picked Pear. Not in a can, or soaked in corn syrup but a true food event. 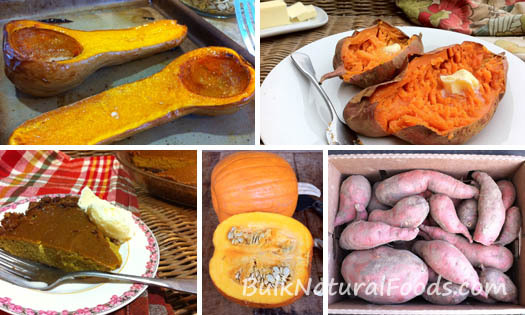 When we bought a box of pears last year from Bulk Natural Foods we were shocked at how amazing they tasted. Our 6 children, who have never eaten canned pears, dove into the box just like they were apples. How happy we were, to be able give our children a truly healthy food that they loved. Next week, when that truckload of Pears, Peaches and Plums rolls into Tennessee, I know my children will be in baited breath, awaiting all the nutritious fruit they can eat. Mealtime or anytime and not just a side show treat at the edge of their dinner plate! Join my family and hundreds of others by ordering Pears, Peaches and Plums. You and your family will be happy you did! 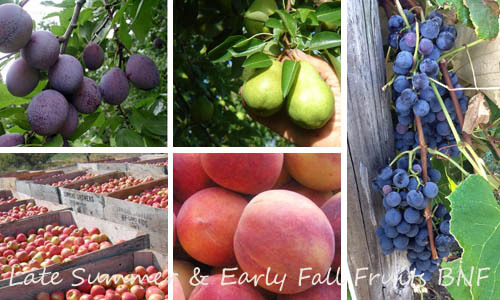 Remember, there’s less than one week left to order Stanley plums, Bartlett pears, Baby Gold peaches, and freestone peaches. Occasionally, the timing works out with one of our growers for us to get more pears later in the fall, but otherwise, this will be the only time this year that we’ll offer plums and pears, and the last time we’ll offer peaches this season. 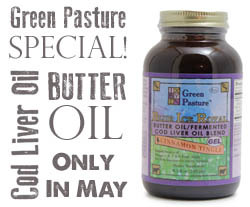 Feel free to order by phone at 931-593-2616. One of our Amish neighbors is doing an experiment that involves you. Yep. He wants to know if you guys like squash, pie pumpkins, and sweet potatoes. If you do, he plans to grow more of these vegetables for us next year. For now, there are just a few cases of each available, so they’ll sell out fast. You’ll find them on our Pear, Plum, and Peaches order form. The squash and sweet potatoes we roasted over the weekend were buttery sweet and a beautiful deep orange, and the pumpkin has become a pie for our supper tonight. One thing to notice here is that the sweet potatoes and butternut squash are odd shapes and sizes; some pretty big and others very small. So if you’re looking for uniformity, please don’t order these local vegetables. Both will come in 25 pound boxes. Also, the sweet potatoes will not be washed as this helps to keep them fresh. 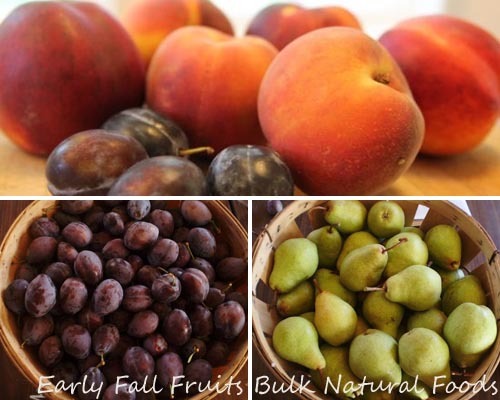 On September 12th and 13th, we’ll be delivering a truckload of Stanley plums, Bartlett pears, and a bonus – two different kinds of peaches; freestone peaches and Baby Gold cling peaches! We had thought this week would be our last peach delivery for the season, but since our plum and pear orchard will still be harvesting peaches too, we’ll be getting more! Learn more about each fruit below. This elongated plum is a bit different from plums you’ll commonly find in stores. The Stanley plum is often used for canning, drying, and baking, but we love to eat them fresh too! Try Stanley plums in plum crumble, plum jam, plum tart, canned, or in this beautiful traditional German plum cake. One of the juiciest pears you’ll find, we love the Bartlett for it’s amazing flavor. Bartlett pears are great for canning, and if you’re careful to put them in the fridge when they’re still hard, they can be stored fresh like that for a few extra weeks. P.S. Feel free to order by phone. 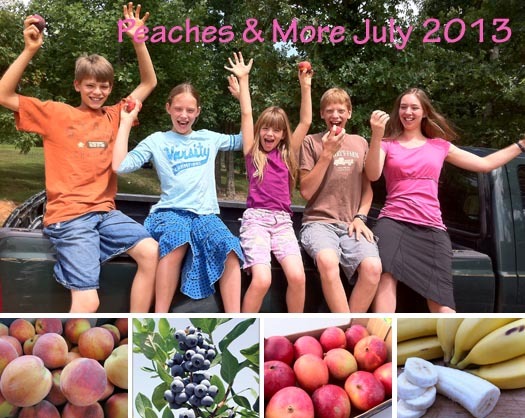 Peaches and Apples – Order Now! Good news! You have a chance to get some juicy ripe peaches before the summer is over AND some of the very first apples of the season! Both the peaches and the apples are sprayed minimally, and both will be picked right before loading onto our trucks so they’ll be sweet and fresh for delivery! 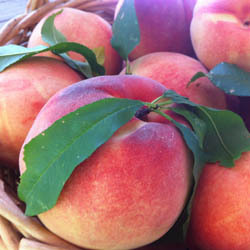 We have two different kinds of peaches available this month: white and yellow. Time to stock the freezer with some more smoothie materials…! But which is better, white or yellow? Really, it depends on your preference. Do you love the intense, sweet-tart peachy flavor of the classic yellow peach? Or might you prefer a sweeter, more mellow flavor – the qualities of the white peaches? While white peaches are less acidic and more sweet, they are also more delicate and easily bruised. If you do venture out to try the less common white peaches, be sure to give us your opinion of them! Our apple selection is limited right now. We’ll have many more varieties as we move into fall. 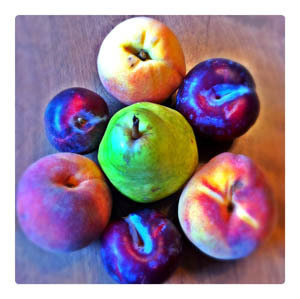 For now, here’s a quick intro to the late summer apples you’ll find on our order form right now. Golden Supreme apples have a mild, sweet flavor and usually quite a bit of juice. They are moderately crispy and sometimes have a pretty pink blush on their greeny-gold skin. 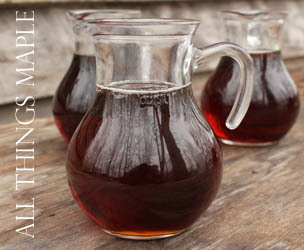 Best Uses: Excellent for fresh eating, drying, baking, applesauce, and homemade apple juice or cider. Beautiful red Gala apples are a favorite among our members. They’re crisp, juicy and sweet with a hint of tartness. Eat them while they’re fresh, use them for applesauce, but don’t try to store your Gala apples. They just weren’t made to be stored. Galas are a cross between Golden Delicious and Kidd’s Orange Red apples. Best Uses: Fresh eating, applesauce, and cider. Golden green Ginger Gold apples are sweet and crisp with a little bit of snappy tartness. They are slow to turn brown, so they tend to behave nicely in salads or anywhere else you may need sliced apples to stay white. Ginger Gold apples are crisp and juicy. Best Uses: Salads, applesauce, sliced apples, juicing, and eating fresh. We have a fairly good selection of dry goods on this order form. Look for chia seeds, quinoa, glass gallon jars, wheat and other grains, apple cider vinegar, raisins, and Green Pasture cod liver oil, just to name a few. Dry Goods quantities are limited this month, so order soon if you’re after this sort of thing. We’ll be opening up our order form for a last load of peaches very soon… should be within the next few days. Pears, plums, more early apples, and a truckload of wheat, dry goods, and organic animal feed. Concord grapes, dry goods, and an abundant variety of apples. If you remember, last year was not a good year for apples (Remember how the late spring frost of 2012 killed most of the apple blossoms?). This year is like the reverse swing of nature’s pendulum; apple trees everywhere are heavy with delicious fruit! Here’s a look behind the scenes into one of our recent emails from the peach orchard we’ll be ordering from later this month. …We anticipate great quality and volume of peaches through Labor Day so I do not see a problem getting your truck loaded up at the end of August. We will have both yellow and white peaches available at that time. All the fruit that will be shipped to you will come directly from our orchards. We’d need your final order on the 26th. We have been having great quality this year, and as long as we stay hurricane free we should be in good shape. We do strive to harvest tree ripened fruit that has the maximum sugar content, and typically we try to harvest, pack, and ship to the customer within 48 hours to keep the quality high for end customer. We would have a fuzzy peach in a box that came straight from the field. I think that’s what you’re looking for. Over the next few months we will be offering more products via postal delivery (several hundred more). If you don’t live in our local delivery range, or if you’d like to have Bulk Natural Foods shipped to your door, we think you’re really going to like this! We won’t, however, be shipping fresh fruit this year or in 2014. (We haven’t quite figured out how to make that work yet.) Only dry goods items will be ship-able for a while. So, woo-hoo! We’ll keep you posted as we move forward on this. Anyway, we’ll be in touch about the upcoming PEACH order. Watch your emails for more information. Erin, The peaches we got last week are just AWESOME! OUR kids sure think so. So we are bringing in another load next week. Want some? On the order form, you’ll also find these delicious seasonal fruits. Note that there is an early order deadline for the bananas. Order deadline: July 8th, 8:00 a.m. Tomorrow, if all goes as planned, we will be adding something special to the order form. Something that is best in July. Any guesses? Watch your emails tomorrow, and we’ll let you in on the surprise! This recipe is from Laura Murray, who found it on allrecipes.com, one of my favorite recipe sites. If anyone makes it and has a photo to share, send it to me, and I’ll post it up! Take a bite and enjoy the sweet from the peaches, feel the heat sneak up on you, then put out the fire with ice cream! Spoon peaches into individual bowls, scoop ice cream over them, and sprinkle with peanut brittle to serve.